As the oldest active literary journal in St. Louis, River Styx is committed to the literary needs of its community. In addition to our journal and reading series, we offer several outreach programs designed to bring the joys and educational merits of creative writing to our community. 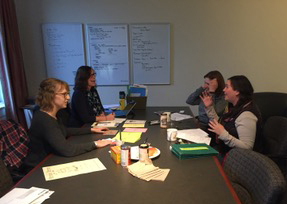 Workshops for teachers: As interdisciplinary field trips, teachers may come to the River Styx office and learn about maintaining, funding, and promoting a magazine. Teachers can read actual submissions to River Styx and discuss which ones they would accept. Forge connections in a field your students want a career in, and contact us today. Volunteer for one of our programs by donating your time to a cause you care about. Make a donation to support our work—you can even donate to specific workshops!